The official Twitter app for Android received a UI makeover today and now “reflects a native Android experience: wider and taller timelines that fill the screen, a flat navigation bar, tap and hold for quick actions, and more.” You can swipe between tabs to quickly navigate, view suggestions as you type user names or search terms, and see links to services whenever a Tweet is shared from another mobile app. 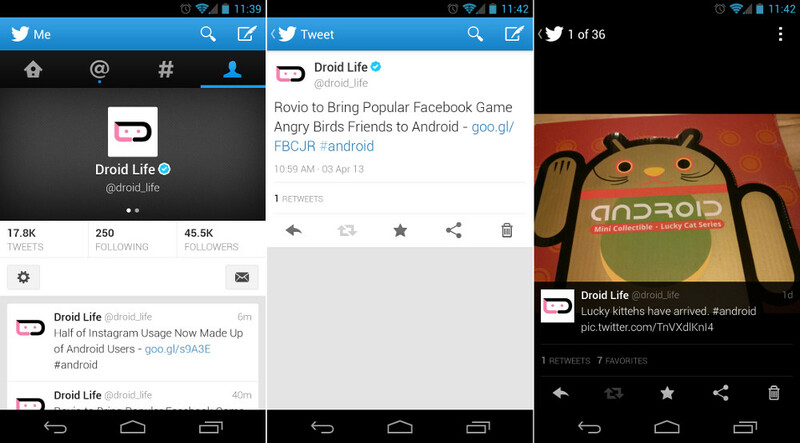 We’ve got a brand new look and feel crafted for Android 4.0+. Navigate seamlessly between your favorite parts of Twitter with a simple swipe. About time, right? Thanks for introducing 2011-12 features, Twitter!